There are two ways to go out. First way is normal where you need to find the fuse box as soon as gate is open and hit it till gate opens up for you. Make sure you do it quickly as guards can hear it. Second of Roblox Jailbreak Tips and tricks is you need to go into playing field and find helicopter. Get in it and get the hell out before cops catch you. You can find weapons like Tazer, Pistol, Riot Shield, Assault Rifle, and AK-47 near the donuts store. In the hideout garage, you will find shot gun and pistol. Roblox Jailbreak Tips and Tricks for bank robbery is very simple. Wait outside with criminals who has keycards. Wait till many criminals gather. Once the light inside the bank is ON, you go ahead and loot. Be careful there will be a SWAT team. When the cops are onto you need to jump as they will Taze you. Jump and run when they fire Tazer. As it takes time to reload tazer you can escape or take the fight into the cops. 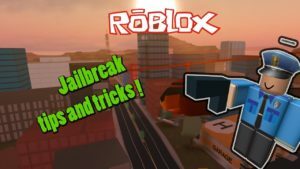 To increase the wanted level you can for this simple Roblox Jailbreak Tips and Tricks you need to kill many cops and rob the banks continuously. This will increase the reward and bounty level quickly. Follow these tips for better gameplay. Let the robbers have keycards and catch them in the middle of bank robbery act. Actually, it is simple. Use these Roblox Jailbreak Tips and Tricks along with your gameplay to get better at Jailbreak. Enjoy the game like never before.